HOUSTON — Half a year has passed since Hurricane Harvey overwhelmed this city with torrential rain, and its leaders are only beginning to plot how to protect the region's vital energy infrastructure and workforce. The most visible idea of all is a third flood-control reservoir, to be built somewhere west of the city at a cost as high as $500 million. The idea has garnered support from Texas Gov. Greg Abbott (R), state and federal lawmakers, Houston Mayor Sylvester Turner, and Harris County Judge Ed Emmett, who leads the county commissioners. Some of the politicians think it could be planned and built in five to 10 years, even though most dams take far longer, now that the federal government has begun doling out tens of billions of dollars for hurricane relief. Flood control planners aren't as optimistic about the timeline, and they also caution that the idea hasn't been thoroughly studied. It's unclear, for instance, how much a potential reservoir on the outskirts of the metropolitan area would help with flooding in downtown Houston. And perhaps most importantly, building any kind of flood control in Houston's rapidly growing edges will be a race to acquire land before it can be developed into new neighborhoods. Houston's sprawl is spreading west at a fast clip, and developers are quickly grabbing tracts where a new reservoir could be built. "Some of the land around us is going for $30,000 an acre," said Bill Pickering, who runs Carl Miller Farms, a hay operation a bit west of where a third reservoir may be built. "A lot of industry is built up around here." Houston's existing flood control structures, the Addicks and Barker reservoirs, were built by the Army Corps of Engineers in the 1940s about 20 miles west of the downtown area. Since then, much of the surrounding area has been converted to suburban neighborhoods and office parks, increasing the amount of water that flows into the lakes when it rains. When Harvey struck, the Army Corps was forced to release water from the two reservoirs for the first time during a major storm, to keep the dams from collapsing. Residents in West Houston say the problems at the dam worsened the flooding in their part of town. Throughout the Houston region, high water damaged 10 percent of the buildings and killed dozens of people. Researchers have warned that Houston has a higher chance of flooding in the future, as climate change causes sea levels to rise in the Gulf of Mexico and increases the frequency of torrential rains (Energywire, Nov. 17, 2017). State and local leaders say they want to rebuild Houston and other Gulf Coast communities to withstand stronger storms in the future. They also have said publicly that Houston's growth could come to a halt if would-be residents become too fearful of floods to move to the area. "We have said from the very beginning that as we rebuild we wanted to do more than just rebuild like it was before," Gov. Abbott said last week. "We wanted to rebuild in a way that would reduce future risk to property and to lives." The third reservoir has emerged as a key component of that strategy; it was in Abbott's $61 billion funding request to the Trump administration, and it's mentioned on the city of Houston's website dedicated to storm recovery. But officials haven't released many details about it. Emmett, the county judge, was part of a conference on flooding yesterday at Rice University in Houston. He expressed disappointment there weren't a lot of elected officials and candidates at the event, but he thinks another reservoir needs to be built. "Everybody seems to be on board with the idea of a third reservoir," Emmett said in an interview. "The question is, where do you put it and who pays for it and who operates it?" 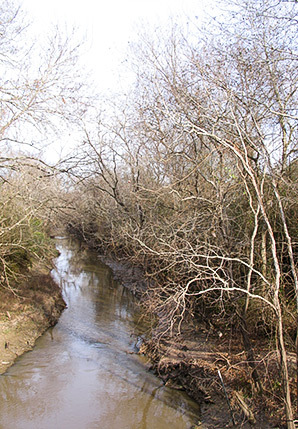 The Harris County Flood Control District, which oversees funding from a dedicated property tax, did a preliminary study in 2015 that found a way to reduce flooding in two critical waterways. A long, low barrier — more like a levee than a full-fledged dam — in the northwest corner of the county would temporarily halt floodwaters going into Buffalo Bayou, which snakes through downtown Houston to the Gulf of Mexico, and Cypress Creek, which flows from west to east across the northern edge of the metro area. The study concluded that the structure could cost $350 million to $500 million, said Matt Zeve, the flood district's director of operations. "You've got to take it with a grain of salt because hardly any engineering and no environmental permitting has been done, no land acquisition has been done," Zeve said. There are a number of other caveats, too. The Army Corps would be the best agency to build the dam, with the flood district as the local partner, since the project would affect the Army Corps' two existing reservoirs, Zeve said. However, bringing the Army Corps into the project would likely trigger a review under the National Environmental Policy Act, which would take three to five years, Zeve said. And that would have to happen before the Army Corps and local authorities could begin acquiring land. Also, the flood district hasn't done detailed modeling on whether the proposed reservoir would prevent flooding downstream of Addicks and Barker dams, which is where the bulk of Houston's population lives, Zeve said. The simplicity of the project could be a selling point, said Jim Blackburn, an environmental lawyer who is co-director or Rice University's Severe Storm Prediction, Education and Evacuation from Disaster Center. A low, earthen levee would hold back floodwater temporarily, and it could be built faster and cheaper than a larger reservoir. Most of the land behind the Barker and Addicks dams is dry except during heavy rains, and it's home to several parks. The land behind the new levee could also be left intact as open space or ranch land and only flooded when it's needed to relieve pressure on the other dams, Blackburn said. But the timing is crucial, Blackburn said. "If we don't buy land when we make a decision, land costs rise, and that makes future land purchases unlikely to occur," he said. Where would the reservoir go? The flood district's study identified the flat, open plains to the northwest of Farm to Market Road 529 and Highway 99. Harris County already owns both a 232-acre park in the area and a large nearby parcel that's also being developed as a park. Adjacent land is owned by the Katy Prairie Conservancy, a nonprofit trying to preserve the natural environment. A driving tour would lead one to believe that it is suitable: The area is flat and relatively undeveloped, and Bear Creek cuts right through it. More open Katy Prairie Conservancy land abutting Cypress Creek can be found a bit farther west, and a lot of the private land next to it is also undeveloped. But landowners here have not been contacted. The prairie conservancy couldn't comment on the third reservoir plan for this story. The Bayou Land Conservancy, which partners with the prairie conservancy on conservation easements, says it has heard nothing on what designs the city or county may have on these parcels. "We have not had a call from anyone at the U.S. Army Corps of Engineers," said Jill Boullion, executive director of the Bayou Land Conservancy. "I do know that they are waiting on funding for a study, so until there is a study I don't think anybody knows for sure." 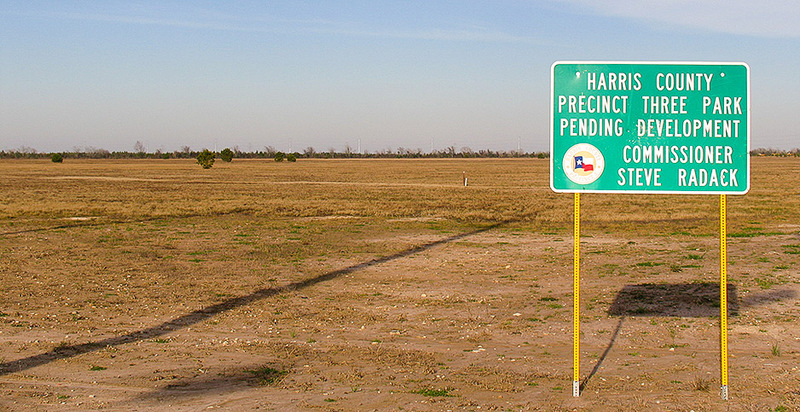 Other large landowners in the area include Bridgeland Development LP, a subsidiary of the Howard Hughes Corp., and a company called Katy Investments LLC, according to Harris County tax records. Farther west, Waller County tax records show more than 200 acres are owned by Sonangol Group, the state-owned oil company of Angola, one of Africa's largest oil producers. Larry Emerson, owner of Dewberry Farm, said he's heard "not a word" on the third reservoir idea. "I would be a little surprised they'd do it here," he said. Emerson has also seen property values rise quickly in western Harris County. He predicts a fight if the government tries to strong-arm landowners into selling property for a new reservoir, but he said Hurricane Harvey may make people more amendable to flood control. "If they move to take it over I think there would be a huge outcry about it, but some of them would probably listen to more ideas about flood control this year than they would in the past," Emerson said. State Sen. Paul Bettencourt (R), who represents northwest Harris County, said local officials are optimistic about their chances of building a reservoir now that funding is available from the federal government. Bettencourt, whose grandparents survived the 1900 hurricane that nearly destroyed Galveston, Texas, said Hurricane Harvey left local leaders with a sense that they have to act quickly. He thinks the reservoir could be built in less than 10 years. "I've never woken up to the sound of helicopters and airboats before. Hopefully we can have a little more alacrity," he said. "There's obviously the political willpower." Last week, Abbott and Turner gathered with other officials at City Hall in Houston to take a victory lap of sorts after Congress passed a nearly $90 billion disaster package. The federal funding will be spread through Texas, Florida, California and Puerto Rico, all of which suffered from storms and wildfires in 2017. Abbott said he expects the funding to be spent on several projects in Texas, such as bayou drainage projects, repairing the Barker and Addicks dams and reservoirs, and perhaps kick-starting the building of a third reservoir. Abbott pledged that Texas will continue to seek more federal money, including through a possible bill in March. Texas is also getting money from the Federal Emergency Management Agency and the U.S. Department of Housing and Urban Development. The money from FEMA could go toward buying out or elevating flood-prone buildings; drainage and reservoir projects to end future flooding; projects that reduce the frequency and severity of flooding; and flood risk-management projects such as dams, retention basins, levies, flood walls, sea walls, jetties, sand dunes and large-scale channeling of waterways, Abbott said. Texas will press for more money to defend Houston, Abbott pledged. "This is not the end of our efforts to seek funding for Texas and for this region," he said, adding that he planned to go back to Washington. State Sen. Charles Perry (R), who chairs the state Senate Agriculture, Water and Rural Affairs Committee, said Houston-area leaders should look at all of their options while they pursue the new reservoir. Even if local leaders are right about being able to build something quickly, it will still take years, Perry said. In the meantime, they should also work on drainage channels, retention ponds, open space and other flood-control tactics that can be put in place faster. "The primary focus ought to be 'What can we do today?'" he said. "If you can't get this fixed, people are not going to go to Houston." Reporter Mike Lee contributed from Fort Worth.